Over the next 28 days Philly Pressbox (https://phillypressbox.wordpress.com) (@phillypressbox) will be doing a review and analysis of each Phillies player, Manager Charlie Manuel and the coaching staff leading up to Opening Day 2012. On Day 7 we preview Joe Blanton. 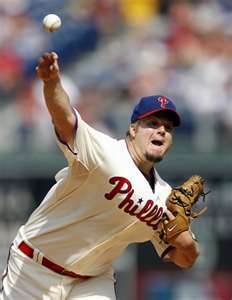 Joe Blanton – Blanton has been somewhat of a mystery man for the Phillies since joining them in a trade with the Oakland A’s in 2008. He arrived with the reputation of being a guy that was a consistent starter that could pitch a lot of innings. Upon his arrival, Joe posted a 4-0 record with a 4.20 ERA in the regular season. He also started 3 playoff games, with the Phils winning all them, while he posted a 2-0 record and a 3.18 ERA while helping the Phils win the 2008 World Series. Joe bounced back with a solid, although not spectacular season in 2009. He won 12, lost 8, with an ERA of 4.05 in 31 starts while eating up 195.1 innings. Joe also pitched in 3 post season games in 2009 but didn’t fare as well, although the Phils won 2 of the 3. He was not the pitcher of record in any of the games while pitching 15.2 innings and finishing with a 5.40 ERA. 2010, again brought another solid but unspectacular season. Joe recorded 28 more starts in his 29 appearances. He finished with a 9-6 record, a 4.82 ERA, while throwing 175.2 innings. In 2011, for the first time in his career Blanton fought the injury bug. He only logged 41.1 innings on the mound while compiling a 1-2 record with a 5.01 ERA. He returned healthy fo the end of season and was added to the Phils playoff roster. As we stated earlier Blanton has been a bit of a mystery. If healthy, the 31 year old is a solid but unspectacular 5th starter that should pitch more than 175 innings for the Phillies. With that said, Joe could be a #3 starter on a lot of other teams that don’t have the starting pitching horsepower that the Phils have. Trading Blanton is possible but not likely. Joe is due $8.5m in 2012. We’re going to look for Blanton to start the season in the 5th spot and to win 12 games in 2012. If he falters, Kyle Kendrick will be ready to fill that spot in the rotation and Blanton will move to long reliever in the bullpen. Tomorrow we will preview Carlos “Chooch” Ruiz. Philly Pressbox would like to welcome our Sponsor, Shop.com. www.Shop.com/BobSullivan . Please click the following link http://www.shop.com/ul!44451!Phillies+shopping-trends.xhtml?credituser=C9407795 for all of your Phillies needs. Shopping made easy right from your home without ever missing an inning of the 2012 Phillies.